Have you read the Elm Creek Quilt series by Jennifer Chiaverini? 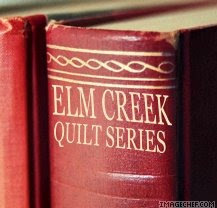 The Elm Creek Quilt series can be read alone as individual books in no particular order and they will still make sense, though there is quite a bit of history divulged in the Quilter's apprentice that I believe provides us with an integral view into what we invest in the characters and should be read first. Her books are thoroughly researched and delightful. You become engrossed and invested in the main characters as if they were a member of your own family. I have learned sooooooooo much (without even realizing it LOL) about not only quilting, but centuries old historical events and their possible alternative outcomes and scenarios. She has a unique and insightful perspective way of writing that truly draws you into the story and era with a visualization of having been there.